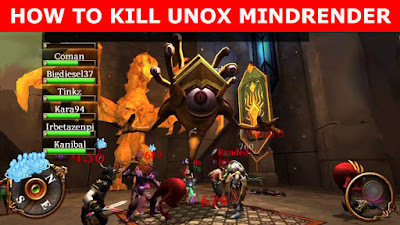 This is the strategy you should use to kill the Exalted Dragonlord boss Unox Mindrender. Unox Mindrender is in the Northernmost dead end chamber of the Forbidden Halls (floor 5). For a 6* you need two groups, a 5* you only need one. However many groups you have, you need at least one druid in each group with Ward of Magic. Unox spams his skills so this ward will help reduce deaths tremendously. The fight starts by killing all the adds (Unox 5*/6* calls adds periodically throughout the fight). Then the tank aggros Unox, and pulls him to the back left corner, with the tank facing out from the corner, and Unox facing into the corner. There is no way to avoid the AoE, so if you can get in close as you can, you will be healed by Natures Breath. Unox also randomly attacks people around him with the Focus Beam skill. Be prepared to take damage by having enough vitality. EDL armor also helps here. The tank keeps him facing to the corner, and everyone else just hits him from behind. Make sure you are using lures, smoke and expose, etc debuffs if you have them to make the fight easier. Kill the adds on spawn, as they will complicate the fight. If he rages, you can bolas walk him around the room. Just make sure that the adds still stay dead as they spawn. Keep the tank alive and away from Unox, because if he gets too close he will cast skills. Kill the adds on one side of the room, and the add circling Unox. You don't need to worry about the other side because Unox 4* doesn't call adds. Then pull Unox over and kill him. You will need 2-3 people for a smooth kill. A one person kill is possible, but it's easier with a couple people.